Induction heating eliminates the inconsistencies and quality issues associated with open flame, torch heating and other methods. Once the system is properly calibrated and set up, there is no guess work or variation; the heating pattern is repeatable and consistent. With modern solid state systems, precise temperature control provides uniform results; power can be instantly turned on or shut off. With closed loop temperature control, advanced induction heating systems have the capability to measure the temperature of each individual part. Specific ramp up, hold and ramp down rates can be established & data can be recorded for each part that is run. Production rates can be maximized because induction works so quickly; heat is developed directly and instantly (>2000º F. in < 1 second) inside the part. Startup is virtually instantaneous; no warm up or cool down cycle is required. The induction heating process can be completed on the manufacturing floor, next to the cold or hot forming machine, instead of sending batches of parts to a remote furnace area or subcontractor. For example, a brazing or soldering process which previously required a time-consuming, off-line batch heating approach can now be replaced with a continuous, one-piece flow manufacturing system. With induction, the part to be heated never comes into direct contact with a flame or other heating element; the heat is induced within the part itself by alternating electrical current. As a result, product warpage, distortion and reject rates are minimized. For maximum product quality, the part can be isolated in an enclosed chamber with a vacuum, inert or reducing atmosphere to eliminate the effects of oxidation. Induction heating rapidly delivers site-specific heat to very small areas of your part, without heating any surrounding parts. This extends the life of the fixturing and mechanical setup. Induction heating systems do not burn traditional fossil fuels; induction is a clean, non-polluting process which will help protect the environment. An induction system improves working conditions for your employees by eliminating smoke, waste heat, noxious emissions and loud noise. Heating is safe and efficient with no open flame to endanger the operator or obscure the process. Non-conductive materials are not affected and can be located in close proximity to the heating zone without damage. Tired of increasing utility bills? This uniquely energy-efficient process converts up to 90% of the energy expended energy into useful heat; batch furnaces are generally only 45% energy-efficient. And since induction requires no warm-up or cool-down cycle, stand-by heat losses are reduced to a bare minimum. The repeatability and consistency of the induction process make it highly compatible with energy-efficient automated systems. When all the above factors are considered, induction heating often proves to be the best and most profitable alternative for your parts and manufacturing process. We invite you to send us your sample parts and process description for a free evaluation and system recommendation. 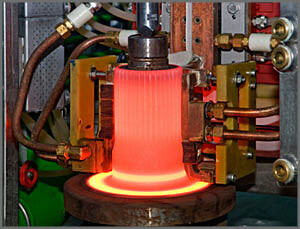 Why not find out if a customized induction heating solution is right for you? For more information, visit our Parts Evaluation page or send us an e-mail. We look forward to hearing from you!